Gov. Pakarathorn Thienchai cuts the first locks of hair off Chonburi men entering the monkhood for 15 days in memory of HM the late King. 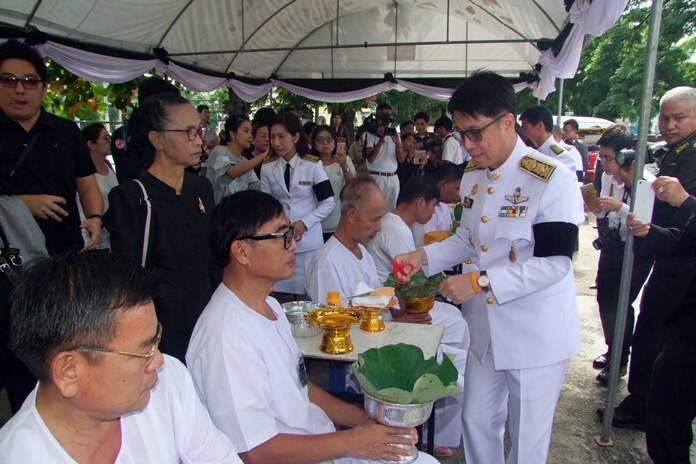 PATTAYA – More than 100 Chonburi men have entered the monkhood for 15 days in memory of HM the late King. Gov. Pakarathorn Thienchai welcomed Rajasitiwimol, abbot of Yai Intharam Temple to the provincial hall for the Oct. 14 ceremony. The 102 men, age 21 and up, dressed in white and had their heads shaved to become novices. Pakarathorn said by tradition men should enter the monkhood at some point to undergo Buddhist teachings to become a pure and good person. Things they learn from the monkhood can also be used in everyday life, like perception, patience, peace and wisdom. On this occasion, however, the novice monks will be dedicating their ordination and monkhood to HM the late King Bhumibol Adulyadej. Dharma will relieve stress and keep them calm, which will grant them a better focus in life. Those who have gone through monkhood will also be role models for the next generation, and more to follow as is the tradition of Thai people. Later in the afternoon, everyone joined in a dharma meditation program before the actual ordination. The “naks” then received their orange robes before paying respect to their parents.